How did I ever grow up to be a cat person? I never owned a cat growing up because my mom was allergic to cats and we only ever had dogs. John and I adopted two kittens in 2010 and since then, I’ve become an avid cat lover. If you follow me on Instagram, you’ll see that I often share pictures of my cats, Princess and Misty. Social media has opened up a whole new world for cat lovers! 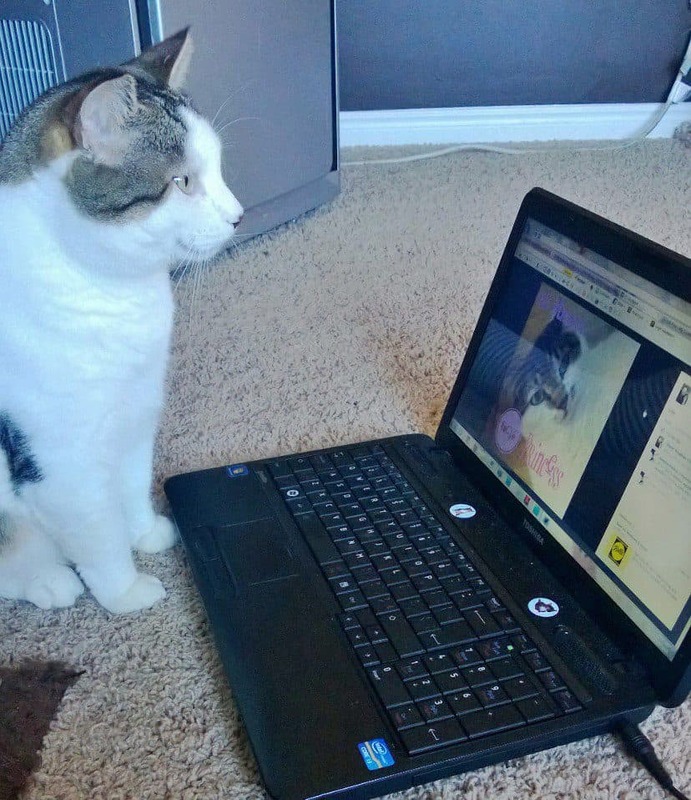 I enjoy checking out my favourite online cats and trust me, there’s a ton! I’ve made a short list of a few of my favourite cats online. Naked And Famous Sphynx Cattery on Facebook: I was googling one day for sphynx cats in Canada and I came across the Naked and Famous Sphynx Cattery based in Bathurst, NB. I immediately ran to show John that I found a place that has sphynx kittens and they were in the Maritimes! I mean it’s not exactly close to us, but we could get there by car and make a little road trip out of it. He wasn’t exactly impressed and said what’s wrong with the two cats we have? I love both Princess and Misty, but I’ve always wanted to own a sphynx. They are the hairless cats with the big ears and wide, bright eyes. Some people think they are ugly, but I find them beautiful! Someday maybe I’ll be able to convince him to add a cute little sphynx kitten to our family. Until that time, I’ll just follow their adventures on their Facebook page. Nathan and Pippin on Facebook: Nathan and Pippin are two gorgeous sphynx cats that I follow on Facebook. Their owner takes amazing photos of them playing with their toys, sleeping, making funny cat faces and just looking cute. They seem very lovable and smart. They sometimes pose in outfits for sphynx cats too! Grumpy Cat™: Of course a list of Internet cats to follow would not be complete without Grumpy Cat. I think she’s probably the most well-known of them all. Did you know that Grumpy Cat now has a book? I saw it on Amazon the other day when I was browsing! I mainly follow Grumpy Cat on Facebook, but she does have an Instagram account too. 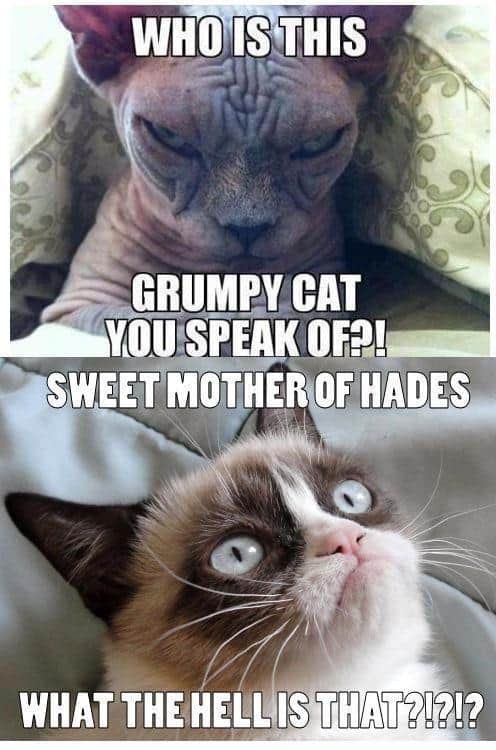 I always get a kick out of reading the Grumpy Cat memes. Some of them are pretty funny! This particular one is my favourite. Catbook on Facebook: This page features cute cat photos from around the world. If you are a cat lover, you will enjoy this page. They often share everything from heartwarming to downright hilarious. After visiting this page, you will see that cats are quite the characters. My 3 Little Kittens on Facebook: This page belongs to a blogger friend of mine in Alberta. She loves to post cute pics of her cats and her three new kittens. All of her cats are really sweet, but my favourite is Anson. He is around the same age as my cat, Princess, and has similar markings. We often joke that they have long distance cat love. Yes, I know that’s a little strange, but look how cute Anson is looking at Princess! Nala Cat on Instagram: On Instagram, I follow this adorable cat named Nala. She has these big round blue eyes and is really the sweetest thing. She has a huge following on there and her pics get thousands of hearts within minutes of posting. She even has her own store now and website! Maru on YouTube: Then there’s the YouTube sensation, Maru! He’s a male cat from Japan, but the videos have English title cards so you can follow along. His videos are HUGE on YouTube with millions of views. Go watch a few and you’ll see why everyone loves Maru! Who are your favourite cats to follow online? Catmoji is like a Pinterest site. But with only cats. …oh, by the way, apparently Grumpy Cat will be getting her own line of drinks. One of them is called a Grumppuchino (lmao). Love! Thanks for sharing with me. so cool! My sister has 6 cats. 3 are the same naked looking kind of cat. I love those cats of hers. O-M-G – that second picture actually made me LOLed. 🙂 I grew up owning several cats over the years when I was a child. As I became an adult, I became allergic to them. Still love them, though! I’m a huge cat lover, too! I have a beautiful Himalayan named Persnickety (Purr-Snickety?) Lol. I also look after several strays in my neighborhood, feeding them and watching out for them. I also love Sphynx cats! Grumpy Cat, too! I follow Blind Cat Rescue on Facebook and it’s a permanent sanctuary for blind cats. You should check it out. You can watch live stream from there, too. Awesome! We have 2 rescue kittens that my daughter named Princess & Sohpie! I’m going to check out & follow these other sites! The only one I knew of was Grumpy Cat. These are way to adorable. I only knew of grumpy cat. Thank-you for sharing the others. I have 2 cats and we all love Grumpy Cat! Gotta say I love Maru, he’s the cutest! I love the Grumpy Cat pictures and the pictures of the two cats in their outfits! Cats are so cute, and I just love to watch them do funny things on the computer! I have a cat that loves to be with me! I’m a total cat person! Love this post, too funny. I used to love grumpy cat but might check out Nathan and Pippin now. I love Maru soooo much. One of the cat sites I like is called Simon’s cat. It is a cartoon but he nails cats/owners purrfectly! Love Grumpy, the funniest meme yet! On Facebook, I also follow Henri the existential cat and Fat Cat. I always thought of myself as more of a dog person too, but we have two cats and no dogs. My photographer friend came over and did portraits of the cats last weekend and it was hilarious! If nothing else, they keep me entertained throughout the day. I LOVE Simon’s Cat on Youtube. I love Sam, he has eyebrows. Currently one of my favorite cats to follow. My friend just sent me a link to your page, I’m NakedAndFamous Sphynx! Haha! I don’t even have the words; I’m floored. As far as I know, this is the first time we’ve been in anyone’s blog. I feel like my kids are little naked celebrities! Thank you so much for talking about us! If you ever convince John to let you have a naked, be sure to let us know! !